Lauduree is a 13-year-old loner, passionate about nature and obsessed with ecological disaster. Greta, her grandmother, is a fiery 50-something nurse jaded by alcohol and disappointment. When Lauduree's mother Tanya runs away to pursue her long-held dream of becoming a make-up artist for the stars, Lauduree tries to make it on her own, clinging to the secluded rural trailer where she lives, to see through her personal carbon sequestration experiment. When she is caught shoplifting, her cover is blown and she is forced to move in with Greta. The new situation compromises Greta's already laid plans to sell her house and move away to live with her boyfriend, Ed. Convinced that her mother will return for her, Lauduree searches for ways to stay in town. She turns to the junior high science club: an activist teacher she idolizes and a lonely new boy. Meanwhile, Greta, daunted by commitment, begins using Lauduree as an excuse to sabotage her plans with Ed. As the two women struggle with Tanya's disappearance, they inch closer together, learning to trust each other as they leap into the unknown. 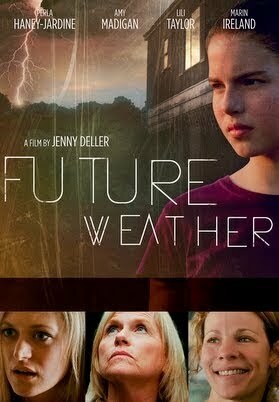 Featuring humorous, sharply drawn characters and powerful performances by Amy Madigan, Lili Taylor, and Perla Haney-Jardine, Future Weather is about finding the courage to survive change.